Devendra Mohanlal Bishoo is a Guyanese professional cricketer who plays international cricket for West Indies. He was born on 6 November 1985 in New Amsterdam, Guyana. He is a right-arm leg-break bowler and bats left-handed. In 2011, he was awarded as the ICC Emerging Player of the Year. Bishoo’s father always wanted him to be a cricketer, so to fulfill his father's wish and to complete his own dream, he had started playing cricket since his school days. In 2007, he was acquired by Guyana Cricket Team but had to wait an year to make his debut. 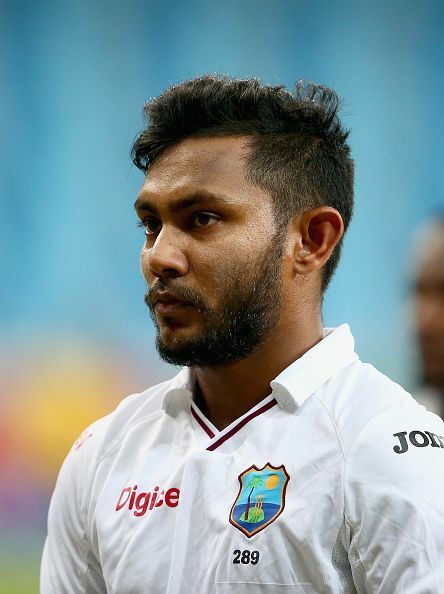 In 2008, Guyana's selectors gave him a chance to represent his domestic team and Bishoo grabbed the opportunity with both hands, claiming 4 five-wicket hauls in his first two seasons. In 2010, he constrained people to recognise him as an upcoming leggie for West Indies when he finished Caribbean T20 tournament with 10 wickets at an average of 8.20 and earned the Man of the Series award. Bishoo was added to the squad, touring to India, Bangladesh and Sri Lanka for 2011 World Cup. He was not the original selection in the team but a replacement for injured Dwayne Bravo. On 17 March, he made his dream debut against England at Chennai and took 3 wickets for just 34 runs after bowling his full quota of 10 overs. In his second game, he bowled with an economy of 4.80 and took wicket of M.S. Dhoni but unfortunately, West Indies lost both the games. After World Cup, he made his T20 debut against Pakistan and earned Man of the match award by claiming 4 wickets for 17 runs. Something similar happened when he got his Test cap against the same team, claiming 4 wickets for 125 runs. He was splendid in 2011 and played almost every match in all formats for West Indies. Perhaps, his body could not have held the workload and 2012 saw a sudden fall in his career. He did not play much international cricket from 2012 to 2015. During the series against Australia, he played a sole Test and could take just 1 wicket and gave 169 runs. In 2015, he regained his spot in the team on the basis of his magnificent performances in domestic cricket. A coincidence took place on 3 June 2015, exactly 22 years since Shane Warne’s ball of the century, when he pitched a ball outside leg stump, made it rip across Brad Haddin’s outside edge and smash the off stump. In the same series, he also took 6 wickets for 80 runs at Windsor Park. On 16 October 2016, playing against Pakistan, Bishoo claimed 8 wickets for 49. This was the second best figures by any West Indian spinner. Later, he finished the Test with 10 wickets and claimed his first 10 wicket haul. In October 2017, in the first Test against Zimbabwe, Bishoo took 9 wickets and led his team to a 117-run victory. In 2013 he was signed by Barbados Tridents of Caribbean Premier League but played only one game. In 2015 season of CPL, he showed his ability to bowl in T20s when he featured for Guyana Amazon Warriors. He claimed 12 wickets with an excellent economy of 5.11 in 7 games. Bishoo has played 26 Tests, in which he has 89 wickets at an average of 37.46. In ODIs, he got 31 wickets in his name in 27 games. He has also played 5 T20I games and claimed 6 wickets at 18.16. Bishoo has got much better stats in first-class cricket, claiming 353 wickets in just 89 fixtures.